Studies point to a relationship between back pain and sleep. The Sleep in America poll ­— a national, random-sample survey of 1029 non-institutionalized adults weighted to be nationally representative that was conducted by the National Sleep Foundation — found that 21 percent of Americans experience chronic pain and that 36 percent report having had acute pain in the week preceding the poll. Of those experiencing chronic back pain, 23 percent report having been diagnosed with a sleep disorder by a doctor, while 6 percent of all others have been. 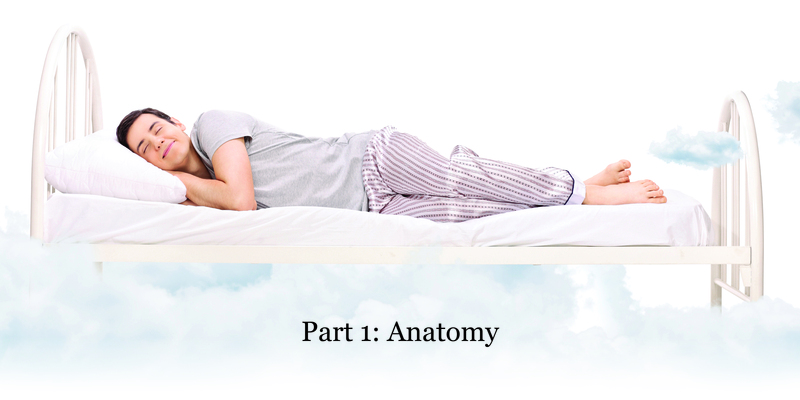 There are five regions to your spine, and all five need to be supported to ensure a restful and restorative night’s sleep, especially if you suffer from one of the above spinal curvature abnormalities. The regions of the spine consist of five areas: the cervical, thoracic, lumbar, sacral, and the tail bone. Thoracic spine (upper or mid back): The 12 vertebrae of the thoracic column are relatively stable because of their attachment to the rib cage and the alignment system. They help protect vital organs. Pain of the upper back, though rarer, includes muscular problems and joint dysfunction. Sacral spine (lower back): The sacral column is a triangle-shaped bone that consists of 5 segments that are fused together. Sacroiliac joint dysfunction, which means pain in the one side of the low back that often radiates down to the knee, is a condition to which young and middle-aged women are most prone. The coccyx (tail bone): The tail bone is the area made up of 3 to 5 small fused vertebrae. It is most likely to hurt from prolonged sitting. Stress and anxiety become a part of a vicious cycle. Back pain, often worsening quality of sleep, can in turn aggravate stress and anxiety. And, in turn worry can lead to physical pain. According to The Anxiety and Depression Association of America, back pain is more prevalent in people with anxiety and mood disorders than those without them. The management of stress and anxiety involves proper diet, sleep, and exercise as well as cultivating social ties. Medication and talk therapy have also proven beneficial in some cases. • It protects the spinal cord, considered the body’s communication system, the nerve roots, and the internal organs of the body. • It provides structural support for an upright posture. • It facilitates flexible movement. In the 2015 Sleep in America poll by the National Sleep Foundation, people with acute and chronic pain reported that environmental factors often disturbed their sleep. The environmental factors that affect quality of sleep included noise, light, temperature, and indeed an uncomfortable mattress.